If you have a big dog then you know that they just love to sprawl out and take up as much space as possible. This can be quite a problem if they happen to do this on the couch or even your bed! The good news is that getting a dog bed for large dogs can give them their own space to sleep without needing to invade yours. Finding the best dog bed for large breeds, however, isn’t always easy. There are a lot of different brands and models on the market with some being better than others. It’s essential to do your research if you need a bed for your big breed. The big barker is a bed that seems to be highly rated everywhere. It has a 7” thick memory foam that is used to make it firm enough to keep its shape, yet soft enough to provide a great level of comfort for the biggest breeds. The cover is also easy to remove and machine washable for your added convenience. Because its made in the USA there is great quality control and the bed is reported to last a long time without needing to be replaced. There are 3 different sizes available that measure 48 x 30 x 7 for the large size, 52 x 36 x 7 for the extra large, and 60 x 48 x 7 for the giant size. There are also a few colors available to look good in many rooms. Overall we consider the Big Barker to be well worth the investment, considering it won’t need to be replaced as often as cheaper pads. This bed is made to last with dogs that are notorious for destroying other couches. It features a waterproof internal zipper case that keeps the other layers nice and dry. It also has a good denim zipper cover that is washable too. There are 3 sizes available for this large pet bed. The Jumbo which is 55 x 47 x 4, the XXL which is 55 x 37 x 4, and the XL which measures 40 x 35 x 4. These are enough to fit a range of bigger breeds. The Armarkat pet bed is a bed that not only looks nice but provides all the necessary features for your large canine. It is fairly durable with a soft and plush fabric that dogs will find comfortable. The canvas on the outside is waterproof and strong to withstand playful pups. It is machine washable for convenience, all you have to do is remove the cover and machine wash it as needed. The inner stuffing is also very thick and holds its shape well for quite a while. One thing to note is that this bed doesn’t have any orthopedic support, to if you have an older or injured dog then you’d be better off with the Big Barker. This one is good for younger and healthier canines. This is an extra large option that measures a whopping 50 x 34 x 7 inches. It is made with thick and hypoallergenic foam that provides great support for dogs with any joint issues or stiffness, giving them a bit of relief. The bottom has an anti slip surface to stop those playful dogs from moving it across the room accidentally. There is also a suede cover that is soft and waterproof to protect the inner layers. This is good if you have a pooch that loves to go play outdoors and get a bit wet. We all know this type of dog and you might even have one in your household! Just as the name would imply, the Beasley’s couch dog bed he is built like a couch but for your dog. The bolsters on the side are made of polyfill and feature of 3 inch pad underneath that’s filled with foam. This bed is made to fit any breed as it is 54 in long. It’s important to keep in mind, however, that the bolsters are included in this 54 in measurement. So the actual space for your pet to rest is closer to 36 in. A great aspect of this bed is that the bolstered sides serve as pillows for your dog’s head. This enables them to sleep for hours very comfortably. You also don’t have to worry about it losing its shape over time because the composition of the cushions is firm enough to last a long time. The jumbo size of the Furhaven Dog Sofa measures 44 x 35 x 4.5 making it large enough for lots of breeds like Labradors. It has a soft foam base that will help to soothe the bones and joints of old dogs. The polycanvas base is water resistant to keep out moisture. The plush surface is great for sleeping and features a lot of support with the orthopedic base. This is a bed that can work for both young and old large breeds. It has a brushed suede cover that is durable and strong. The cover is easy to remove and wash because it has an L shaped wrap around zipper that makes it easy to get off. The bottom features a non-skid backing that helps to avoid slipping. The outer layer is 2 inches thick and made of soft foam. This helps to keeps the weight distributed evenly and lasts a long time as well. There are multiple sizes available including an XL option that measures 46 x 27 x 4. This entire pet couch is made of 4 inch thick foam. The outer bolster is composed of polyfill which is known to be very comfortable for pets. They can use the outer bolster to rest their heads. It’s really a good sight to see your pooch with his head comfortably sat on the bolster of the bed. 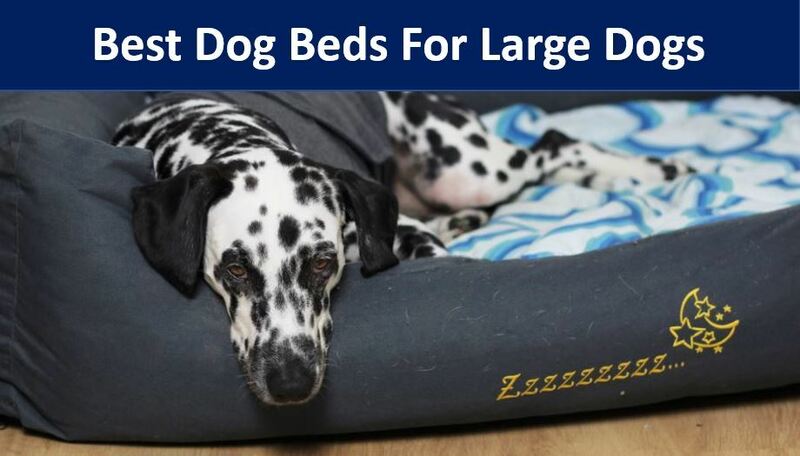 There are three sizes available for this bed to fit a wide variety of dogs. The large and extra-large size will fit a wide variety of bigger breeds that you may have. The setup of this product is very easy because the pad is already inserted in the cover. All that’s left is to zip up the base and you’re pretty much done. This is a portable large dog couch that is great for outdoor, as well as indoor use. The steel frame is tough and measures 43.5 x 29.5 and has a surface for sleeping that is 29 x 22. This should be enough for a lot of large breeds but make sure to measure your pooch. It is easy to wash and doesn’t require a lot of maintenance. It’s a great sofa to take camping and will help to keep your big pup off the hard ground and staying comfortable. You can set it up by the fire at night and let your pooch relax next to the family. In your search for a bigger bed for your pup, there are a few things that you must consider. It may seem like a simple purchase but there are a few things that we are going to go over. When it comes to the filling, you don’t want to go cheap. A low-budget filling will only really work for smaller pets that don’t weigh very much. A heavier dog will end up making dents in the filling and moving it towards the edges. One of the best fillings that you can get is memory foam because it is able to maintain its shape for many years. Getting a larger dog bed with a removable cover is going to make your life a lot easier. The reason for this is that you can easily remove the cover and wash it in the machine. This will prevent your house from having that dog smell all the time. If the cover isn’t removable then you won’t be able to wash the bed easily because you can’t exactly throw the whole bed in the washing machine. Instead, you off the spot clean it which isn’t very effective. It’s always nice to be able to find an option that is not too expensive. However, you don’t want to go too low in your price range because you truly do get what you pay for. It’s good to think of a larger dog bed as an investment because of how much time your pet will end up spending on it. It’s especially important for older canines to get the correct type of bed that they need if they have any injuries or arthritis. You don’t have to be a home decorator but you still want to have a dog bed that looks good in whatever room you decide to place it. Getting a color that matches the room will help to make the bed blend in. The type of bed is also important. Dogs like to sleep in certain positions and some beds are better at allowing them to sleep the way they want to. Pad types of beds are good for canines that like to sprawl. Whereas dogs that curl up will do better with a bolstered bed. Over time, dogs can place a lot of stress on the material of the bed. Bigger breeds especially have a tendency to destroy a lot of their belongings. If you have a problem pup, then you’ll want to get a tougher bed that can withstand all the abuse that they throw at it. If you want to see some other options then you can view more top rated dog beds over here.